Purpose: To determine the fatigue resistance and failure mode of endodontically treated premolars using direct composite resin restorations. Materials and Methods: Eighty-four human premolars were divided into seven groups of 12, prepared as follows: Intact teeth used in Group 1 as control, the second group covers the endodontically treated teeth, restored with direct onlays using Z250 composite resin, the next two groups (i.e. 3,4) were similar to the second group, but subjected to 1 and 2 million fatigue load cycles, respectively. Groups 5, 6, 7 were similar to groups 2, 3, 4, however, in these groups Tetric Ceram was used as the restorative material. All specimens were loaded using a Universal Testing Machine until fracture occurred. One-way Anova andTukey's HSD tests were used to analyze the data of onlay groups. Results: All specimens withstood the masticating simulation. The mean fracture strength for Goups 1 to 7 was: 1276.92, 1373.47, 1269/70, 486/35, 484/12, 1130/49, 1113/79 Newton, respectively. No statistically significant differences were found between the groups in fracture strength and failure mode. Conclusions: No statistically significant differences in fracture strength were found between sound teeth and composite onlays that were subjected to 1 and 2 million fatigue load cycles. What would be the effect of mechanical and thermal stresses to oral conditions on the fracture resistance of these restorations? In the present study 84 human premolars which were extracted due to orthodontic treatment or periodontal disease were used. 1) Normal anatomy without any anomalies; 2) Presence of no crack or caries on crown or root surfaces with use of transillumination; 3) Their dimension be the same as measurement done by Galan JR for crown (gingivo-occlusal: 7.8-8.8 mm, mesiodistal: 7-7.4 mm, buccolingual: 9-9nmm). With the use of Research Randomizer Software ( http://www.ResearchRandomizer.com ),  the teeth were randomly divided into seven groups of 12. Except one group of 12 teeth (control group), the rest of the teeth were endodontically treated and mesio-occluso-distal (MOD) cavity preparation was done using high-speed hand piece with air-water spray and fissure bur. Group 1: Sound teeth as control group. Group 2: Restoring the teeth with Filtek Z250 composite resin and evaluating their fracture resistance after being subjected to static load as baseline (without cyclic loading). Group 3: Restoring the teeth with Filtek Z250 composite resin and evaluating their fracture resistance after being subjected to fatigue with application of 1 million thermo-mechanical cycles equal to four years of chewing. Group 4: Restoring the teeth with Filtek Z250 and evaluating their fracture resistance after being subjected to fatigue with application of 2 millions thermo- mechanical cycles equal to eight years of chewing. For Groups 5, 6 and 7 Tetric Ceram composite was used but force application was similar to Groups 2, 3 and 4. 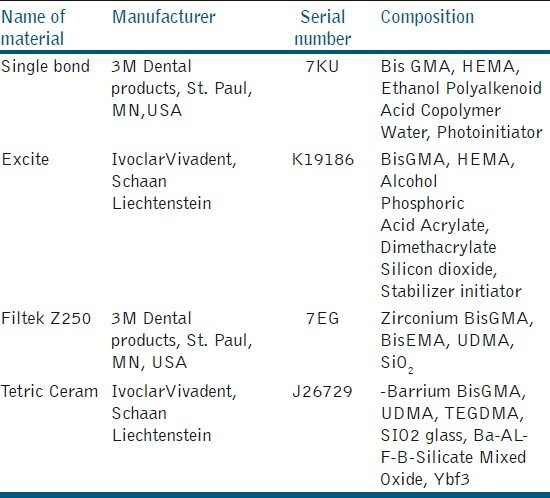 Names, compositions and manufacturers of materials used in this study are given in [Table 1]. Before restoring the teeth with direct onlay, 2 mm of guttapercha was removed from the canals in order to pack the composite inside the canals (corono-radicular technique). Then teeth were etched using 37% phosphoric acid for 15 sec and rinsed for 15 sec with air-water spray and gently air-dried for 3 sec without completely drying the cavity (wet bonding). In Groups 2, 3 and 4, in order to use resin composite (Filtek Z250), single-bond adhesive was applied and then cured for 20 sec, using an LED light cure unit (LED Demetron/ Kerr, Danburay, CT, USA with) with 600 mw/cm 2 . In the next step, Z250 resin composite was placed incrementally using buccolingual layering technique with 2-mm thickness of each layer and was then light-cured for 20 sec. With the use of the silicon mold which was made before cavity preparation, the last layer of composite (occlusal surface) was placed so that the anatomy and thickness of onlay was controlled. After finishing the restoration, curing of all aspects of tooth was done for 40 sec. In Groups 5, 6 and 7 Tetric Ceram composite was used. After completion of restoration, samples were kept in distilled water at room temperature (maximum time of storage was 48 h), till the test was done. All teeth were mounted in PVC molds of self-cured acrylic resin with 25 mm diameter and 20 mm height, and were kept 1 mm below CEJ. Groups 3, 4, 6 and 7 were transferred to an artificial mouth machine. In Groups 3 and 6, the number of cycles applied was 1 million cycles and in Groups 4 and 7, 2 million cycles were applied (3 Hz frequency, 50 Newton load). After finishing the load cycles in the artificial mouth machine, all teeth were subjected to stress with a speed of 1mm/min in a universal testing machine (BDO-FBOZ TN/Zwick / Roell) which was kept perpendicular to the occlusal surface of the teeth till they fractured. Data collected from the results were analyzed using SPSS software. One-way ANOVA in conjunction with Tukey HSD test were used for comparison of fracture strength of the six experimental groups with onlay composite. Two-way ANOVA test was used for evaluating the effect of type of material and load cycle. Non-parametric Kruskal Wallis and Mann-Whitney tests were used for comparison of fracture strength of groups with onlay composite and control group. Statistical criteria with regard to the study groups are given in [Table 2]. The first part of the statistical analysis belongs to the six experimental groups (with onlay composite), without considering the control group. The ANOVA test showed that there is a statistically significant difference between the fracture resistance of groups (P<0.0.5). Tukey HSD test showed that there were no statistically significant differences in the fracture strength of the important groups of the present study (based on the aim of the study) (P>0.05). The average amount of fracture load in the seven experimental groups has been shown in [Figure 1]. Results showed that type of material had a significant effect on strength with P value of less than 0.01; but number of cycles (time effect) did not have a statistically significant effect on fracture strength (P=0.056). The second part of the statistical analysis is related to the comparison of the experimental groups with the control group in which non-parametric Kruskal-Wallis test was used. Considering P<0.05 as significant value, seven groups showed statistically significant differences, but for comparison of different groups with each other Mann-Whitney test was used which showed no statistically significant differences between the control group and experimental groups (P=0.05). The aim of the present study was to determine the longevity and long-term prognosis of direct composite onlays on posterior teeth, and if such restorations are subjected to mechanical and thermal stresses, what would be the effect of such stresses on the fracture resistance of the restored teeth. The results of present study showed that the fracture strength of the Z250 composite at time intervals of 0, 4 and 8 years was higher than Tetric Ceram onlays, but fracture resistance of both the materials reduced with time, although the difference was not statistically significant. Teeth restored with direct composite onlays (Filtek Z250 and Tetric Cream) could increase fracture resistance. Although the strength of onlays made with Z250 was more than that of the natural sound unprepared tooth, the difference was not statistically significant. Direct onlays made with hybrid composites Z250 and Tetric Ceram in endodontically treated premolars, after being subjected to 1 million and 2 million thermo-mechanical cycles equal to four and eight years of chewing showed favorable fracture strength. Fracture resistance of hybrid composite onlays decreased 9% after four years and 11% after eight years. The type of material used for restoration, irrespective of the number of cycles has an effect on the fracture strength of the tooth, in such a way that Filtek Z250 showed higher fracture resistance compared to Tetric Ceram. 1. Heydecko G, Butz F, Hussein A, Strub J. Fracture strength after dynamic loading of endodontically treated teeth restored with different post and core systems. J Prosthet Dent 2002;87:438-45. 2. Gonzalez-Lopez S, De Haro-Gasquet F, Ceballos L, Bravo M. Effect of restorative procedures and occlusal loading on cuspal deflection. Oper Dent 2006;31:33-8. 3. de Freitas CR, Miranda MI, de Andrade MF, Flores VH, Vaz LG, Guimarães C. Resistance to maxillary premolar fractures after restoration of class II preparations with resin composite or ceromer. Quintessence Int 2002;33:589-94. 4. Fusayama T. Posterior adhesive composite resin: A historic review. J Prosthet Dent 1990;64:534-8. 5. HabekostLV,Camacho GB, Azevedo EC, Demaro FF. Fracture resistance of thermal cycled and endodontically treated premolars with adhesive restorations. J Prosthet Dent 2007;98:186-92. 6. Dalpino P, Francischone C, Ishikiriama A. Fracture resistance of tooth directly and indirectly restored with composite resin and indirectly restored with ceramicmaterials. Am J Dent 2002;15:389-94. 7. Papadogiannis Y, Lakes RS, Palaghias G, Helvatjoglu M. Fatigue of packable dental composites. Dent Mat 2007;23:235-42. 8. Kuijs RH, Fennis WM, Kreulen CM, Roeters FJ, Verdonschot N, Creugers NH. A comparison of fatigue resistance of three materials for cusp replacing adhesive restorations. J Dent 2006;34:19-25. 9. Kern M, Strub JR, Lu XY. Wear of composite resin veneering materials in a dual-axis chewing simulator. J Oral Rehabil 1999;26:372-78. 10. Wilder JR, Bayne S, Taylor DF. Seventeen years clinical study of cured posterior composite class I, II restoration. J Esthet Dent 1999;11:135-42. 11. Eakle WS, Staninec M, Lacy AM. Effect of bonded amalgam on the fracture resistance of teeth. J Prosthet Dent 1992;68:57-60. 12. Aghazademohandesi J, Barzegaran U, Shafiei F. Compressive fatigue behavior of dental restorative composites. Dent Mater J 2007;26:827-37. 13. Brandao L, Adabo GL, Vaz LG, Curysaad JR. Compressive strength and compressive fatigue limit of conventional and high viscosity posterior resin composites. Braz Oral Res 2005;19:272-7. 14. Drummond J. Degradation, fatigue and failure of resin dental composite materials. J Dent Res 2008;87:710-9. 15. Braem MJ, Lambrechts P, Gladys S. In- vitro fatigue behavior of restorative composites and glass ionomers. Dent Mater 1995;11:137-41. 16. Lambrechts P, Braem MJ, Vanherle G. Evaluation of clinical performance for posterior composite resins and dentin adhesive. Oper Dent 1987;12:53-78. 17. Htang A, Ohsawa M, Matsumoto H. Fatigue resistance of composite restorations: Effect of filler content. Dent Mater 1995;11:7-13. 18. Kim KH, Kim YB, Okuno O. Microfracture mechanisms of composite resins containing prepolymerized particle fillers. Dent Mater J 2000;19:22-33. 19. Zhao D, Botsis J, Drummond JL. Fracture studies of selected dental restorative composites. Dent Mater 1997;13:198-207. 20. Elliot JE, Lovell LG, Bowman CN. Primary cyclization in the polymerization of bis-GMA and TEGDMA: A modeling approach to understanding the cure of dental resins. Dent Mater 2002;17:221-9. 21. Sideridou I, Tserki V, Papanastasiou G. Study of water sorption, solubility and modulus of elasticity of light-cured dimethacrylate-based dental resins. Biomaterials 2003;24:655-65. 22. KarabelaMM,Sideridou ID. Effect of the structure of silane coupling agent on sorption characteristics of solvents by dental resin-nanocomposites. Dent Mater 2008;24:1631-9. 23. Aghazademohandesi J, Rafiee MA, Barzegaran U, Shafiei F. Compressive fatigue behavior of dental restorative composites. Dent Mater J 2007;26:827-37.
costa, s. and silva-sousa, y. and curylofo, f. and steier, l. and sousa-neto, m. and souza-gabriel, a.